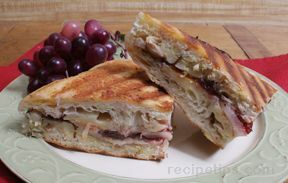 The subtle taste of pears adds a light citrus fruity overtone to the meat without overpowering the flavor of the turkey. The roasted pears make a delicious side dish to serve with the turkey. For turkey cooked to perfection, use our Turkey Cooking Times chart. 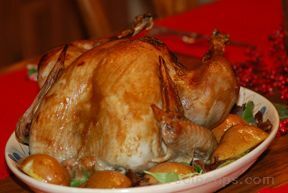 Preheat oven to 325° F. Make sure turkey is fully thawed, cleaned and ready to cook. To clean turkey, rinse inside of turkey carcass with cold water and then dry moisture away from outside with paper toweling. Seasonings can be applied on the inside of the cavity of the turkey. Rub outer skin with butter and season outside to taste, if desired at this point. Using a roasting pan and roasting rack with handles, place turkey on rack in pan. Handles will simplify and assist later with safe removal of the roasted meat when finished. Insert oven-safe thermometer into the meat where it will not touch any parts of the turkey bones. 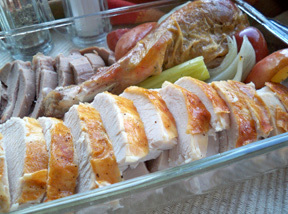 Place a loose fitting wrap of foil over the turkey that is in the roasting pan. The breast meat and drumsticks should be positioned upward in the pan. Place ends of drumstick bones beneath the skin that surrounds the tail or secure them to the tail with oven-safe twine or cooking bands to keep ends from burning. The tips of the turkey wings can also be tucked up under the skin to keep from unnecessarily blackening the thin ends. Using a small saucepan, combine pear nectar with packed brown sugar, Dijon mustard, Worcestershire sauce, salt, ground nutmeg, and cayene pepper. Stir together and gently boil uncovered. Reduce heat to achieve a glaze textured mixture. As butter melts, mix thoroughly with other ingredients. Cook about 7 to 8 minutes on medium heat. Stir frequently until mixture becomes slightly thickened. Roasting will require 2 to 3 hours, until internal temperature reaches 180Â° F. As the turkey completes the last 45 minutes of cooking, the foil placed over the turkey can be removed, the string holding the drumsticks can be brought out from beneath the skin holding them. The drumstick bones can also be untucked from beneath the skin as well as the turkey wings tucked under the skin can be removed. These steps will allow the meat to cook more evenly and fully. Baste turkey with pear glaze during last 30 minutes of baking cycle and then again 15 minutes later. When fully cooked, remove turkey from oven and remove from roasting pan, allowing turkey to remain on roasting rack that can be set on a large cooking sheet. Place foil loosly over turkey as it rests on rack, allowing meat to stand and cool for approximately 15 to 20 minutes prior to carving. Add about 1 cup of water to pan drippingss for pears to bake in if there is not enough moisture in pan. Add halved pears to baking pan, baste with pear glaze and bake pears for 20 minutes. 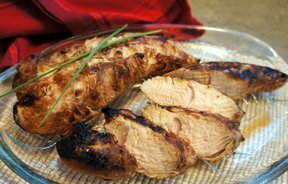 Baste with pear glaze for approximately 20 minutes.